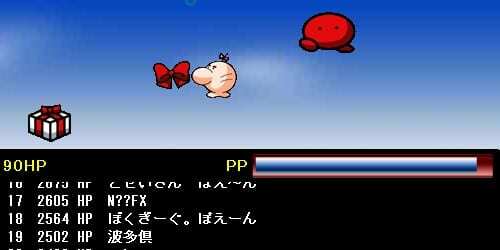 A little while back I came across a simple Mr. Saturn-themed game, the title of which translates to “Mr. Saturn Flies Through the Sky!” You can check it out here! The story is that Mr. Saturn has run out of things to sell in his shop, so he needs to collect a bunch of stuff to stock up on. But sometimes Giygas’ bad guys will come and try to get in the way. Basically, you have to collect the items and avoid the bad guys while also keeping your power up. It’s not a very hard game (at least it wasn’t for the five or ten minutes I played) but it’s still kind of neat. I think more variety and possibly some background music could’ve made it better. There’s a high score list that gets cleared once in a while too, but given the age of the game it probably doesn’t get cleared much anymore. So if you want to get your name up there, this is your chance! Ha, what a cute little game. Got boring after a few minutes, though. It scrolls by very quickly, but at the end of the high score list, it says it was programmed by Miko San and is copyright of AnkoHouse. It also says it was originally programmed in Java. Pretty fun, but definitely easy and boring after a while. I could probably get my name up there if I had the slightest bit of patience. Oh I just found a way to make it to be much more fun. I loaded up Cheat Engine (cheatengine.org) and enabled speedhack, to make my browser run faster. wow. I played that with my buggy laptop touch mouse box thingy. probably would have gotten a lot higher of a score if I had an actual mouse to play with. I remember these, I found a Metroid themed one a while back. I am Fiends (EB Forums) I got a high score… I could get higher but it’s kind of boring. Hey neonix, hold down the mouse button……. Oh wow, thanks for that tip Mother 4. It seems you get less points when you do that, but then other times you get more points. it’s a pretty neat game. I think it could be better though. I got 15th, put EBcentral up there. Maybe someone will see it and find this site. I got bored and killed myself after about fifteen minutes. My score was something like… 1500-something. W00t! I got 30th place. I named my high score thing localize_mother_3!